Best Memory Card Recovery Software, recovering files in 3 Steps! Memory Card is a removable flash memory card format, launched by Sony in October 1998, and is also used in general to describe the whole family of Memory Sticks. Typically, Memory Sticks are used as storage media for a portable device, in a form that can easily be removed for access by a personal computer. Memory Card Recovery Pro will solve all data loss issues on a memory stick. Quick Scan and Recovery Speed: One of the biggest advantages of this software is its recovery speed. When you do a recovery with Memory Card Recovery Pro it just takes a few minutes to finish the scanning and recovering process. You just need a few clicks of your mouse and everything is OK. Support All Devices: The devices that can store images may include: Camera, SD card, Cell Phone, Memory Card, USB, PC, Mac, MP3, computer hard drive and external hard drive. Support All File Formats: Except for image formats, Memory Card Recovery Pro also supports other file formats lik: Audio files, Video files, Emails, Documents, Archives, etc. Support Almost All File Systems: File systems such as FAT, CramFS, JFS, Linux, RAID 4, RAID 6, NTFS, XFS, BeFS, BSD disklabel , HFS, RAID 1, RAID 5, LVM and etc. Support Wise Device Error Messages: Some error messages like Format error, file error, Write error, Read Error, Memory card error, SD card error, Corrupted data error are very common in data loss. Because of these errors, we lost some precious photos. Wide System Compatibility: is compatible with all versions of Windows operating systems such as Windows 7, XP, Vista, 2000, 2003, 2008, 32 and 64 bit. And Mac OS X 10.8 (Mountain Lion), X 10.7 (Lion), 10.6 (Snow Leopard), 10.5. Memory Card Recovery Pro provides you an exclusive feature for recovery of lost photos, songs, videos, movies, and other multimedia files. Furthermore, it can perform safe optical media recovery to rescue all the seemingly lost files from severely damaged or incorrectly burnt optical discs. 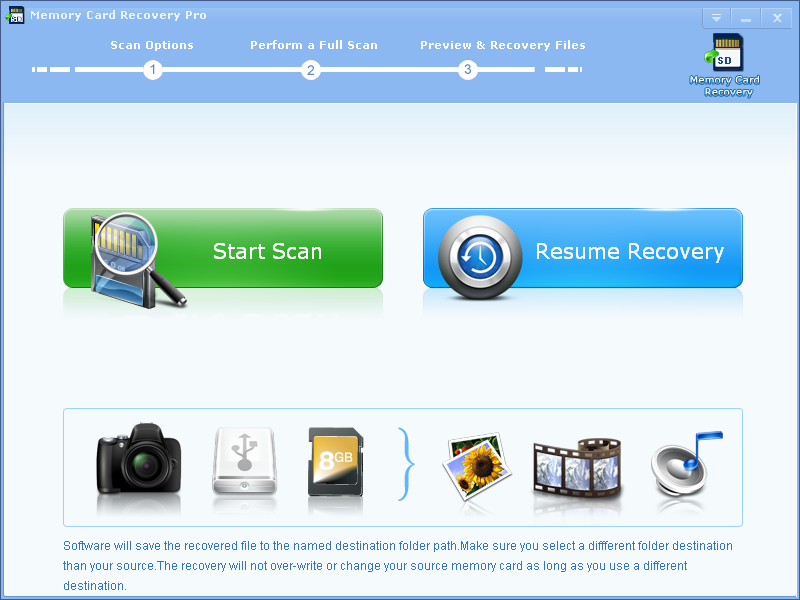 * Memory Card Recovery Pro will undelete all type of photos from your Memory SD card or disk.